My parents were a real chalk-and-cheese couple. Take their attitudes to their family histories. My mum would gladly spill the beans about all the scandals. There was her Auntie Dorothy, who had an affair with a married man and left Uncle Jack. But the married man changed his mind (I'm sure Mum said his wife changed it for him), so Auntie Dorothy went home and shunted Uncle Jack into the front room, where he spent the rest of his days in a bedsit in his own house. Then there was Mum's Italian grandmother, who, when she'd had enough of Mum's Irish grandfather, walked out with the furniture one morning after he left for work, a move that was masterminded by two of her children. Another son had bought her a house in Fogg Lane in Didsbury, a place he was well acquainted with, as he was having a bit on the side up the road. Not to mention Gran (my mum's mother), who was engaged three times before she tied the knot and later became the merriest of widows; and Gran's sister, who, in her twilight years, Lived in Sin, in the days when Living in Sin still warranted capital initials, with her boyfriend. In fact, if Mum was to be believed, she was the only female on both sides of her family to have lived a moral and blameless life, the rest of us - myself included, to Mum's profound dismay - being as pure as the driven slush. Dad, on the other hand, knew almost nothing about his family's immediate past. An only child, he grew up with his parents and Uncle Gordon, his mother's much younger brother... or perhaps Gordon was a half-brother... Dad didn't know and couldn't see how it mattered. But it does matter. I wish now that I had asked more questions and dragged more information out of him; but he died 20 years ago this November and there is no one who can answer my questions about his mother. I've done masses of family history over the years. I have traced different lines of my family back into the 1800s... 1700s... 1600s. Yet – frustratingly – I can't find out about my one of my grandmothers. Dad's mother was Dorothy Mary Shires, neé Harrop, daughter of William Henry Harrop... or was she? The 1911 census return lists William Henry Harrop's household as himself; his wife of 15 years, Alice Mary; his son Harold, 13; daughter Dorothy, 11; and Gordon, aged 4 months; which suggests that Alice was mother to all three children. But I can't trace any marriage certificate for William and Alice; neither can I find birth certificates for Harold or Dorothy Harrop, though I do have a copy of Gordon's. He was the son of William Henry Harrop and Alice (Gorton) Harrop. I shan't go into all the twists and turns of the research I've undertaken, except to say that everything I've tried has met with a dead end. Were Harold and Dorothy the children of William and Alice? Or were they the stepchildren of one of the parents? It is possible – and this isn't me being fanciful; it's based on a fragment of evidence – that the children were orphans who were adopted by the Harrops. Unfortunately, there's no way of finding out for certain, as adoption records didn't start to be formalised until the 1920s. If there's one thing I've learned about old census returns, it's that they don't necessarily tell the truth. Just because William and Alice claimed a 15-year marriage doesn't make it true. Maybe it was put on the census to make having a son of 13 look respectable. The number of mistakes I've found on old census returns is startling. Presumably, the returns were filled in by the master of the house and all I can say is that, among my ancestors, there's a shocking lack of paternal knowledge of their children's ages and names. Yes, names. 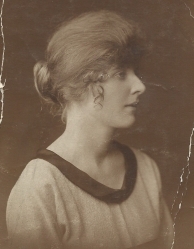 Jessie Eveline whose name is spelt with an I in 1901 becomes Jessie Evelyne with a Y in 1911. And Rosina, who was her whole life known as Rosie, is entered on the census not as Rosina or even as Rosie, but as Rose, a name she was never known by. Years of birth change from census to census as well. It has always seemed to me that old census returns would have been much more accurate if only the mothers had filled them in. Surely the best use that was ever made of the census was by Elizabeth (Fuller) Hardy, who used successive census returns to take advantage of a lady's privilege to be – ahem – vague about her age. Sarah Bavin and Brighten Hardy had a son called Brighten Bavin Hardy - he was Gran's grandfather. (That's Gran who had the 3 fiancés.) Brighten Bavin Hardy married Elizabeth Fuller in 1868, when he was 21. Elizabeth modestly gave her age on the marriage certificate as "full age," ie 21 or more. In fact she was 32, which was one heck of an age in those days to be marrying a mere lad of 21. But Elizabeth was clearly a lady of initiative and in subsequent census returns, she changed her year of birth until she was a mere 5 years Brighten Bavin's senior - far more appropriate! And all without the use of age-defying creams. What a most intriguing post! Like your dad, mine is a classic example. His mother's sister 'ran away' from the family home aged 16 and, why, is a mystery I've always wanted to solve. She disappeared off the radar until she was in her 90s when she contacted my grandmother, who by then was in her 80s and the only sibling of 6 still alive. When I began doing family history and I searched the records for illegitimate children in her name, my dad said, "oh, I never thought of that...". Sigh! No imagination, some people! What a fascinating read! I really enjoyed it. Have you considered adapting your family history into your fiction? Fascinating stories illustrating the 'more things change...'!! I too wish I'd asked more questions of older relatives while I still could as, like yours, there are gaps on my family tree which will likely never be filled. Thanks for an interesting read.